Capital Region startups (0- to 1-year-old firms) are regaining the employment momentum, according to a Center for Economic Growth (CEG) analysis of the U.S. Census Bureau’s Quarterly Workforce Indicators (QWI) Explorer. In 2016, privately owned startups employed 12,209 workers throughout the eight-county Capital Region, up 827 jobs, or 7.3 percent, from the previous year. Over the last five years, local startup employment was up 2,182 or 21.8 percent, according to QWI Explorer beginning-of-the-quarter counts, which are similar to point-in-time counts used in the U.S. Bureau of Labor Statistics’ better-known Quarterly Census of Employment and Wages (QCEW). That total represented only 3 percent of the region’s private sector employment, but the local economy’s growth largely hinges on the success of these fledgling firms. 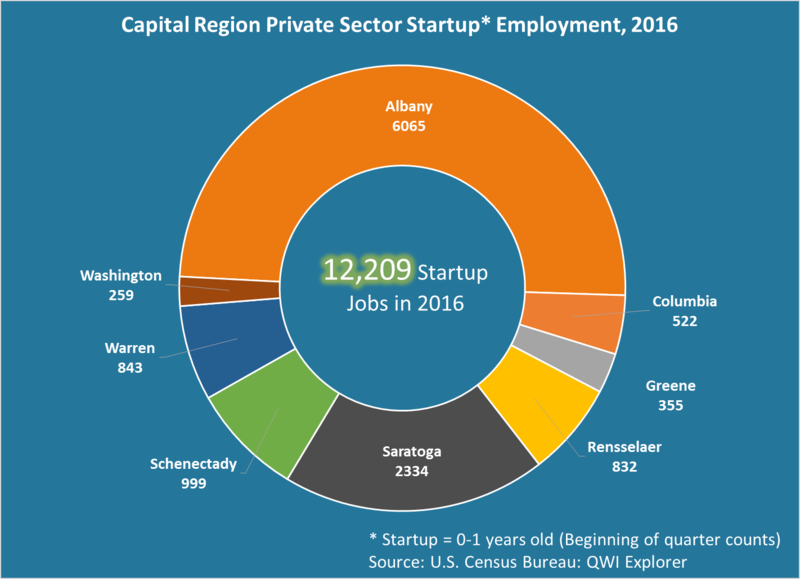 A majority of the Capital Region’s startup growth came from Albany County, where startups added 1,597 jobs over the year and 2,280 since 2012. Schenectady and Warren counties also made significant gains over that five-year period, adding 134 and 167 jobs, respectively. Venture pitch opportunities before professional and angel investors. Identifying potential investors and mentors. For more information about the VentureB Series, contact CEG Entrepreneurship Program Coordinator Ellyn Ford by email or by phone at 518-465-8975, ext. 243. For more information about CEG’s role as an operational partner of Innovate 518, contact CEG Business Growth Solution (BGS) Director Michael Lobsinger by email or call 518-465-8975 ext. 238.